Hereford Chess Club: Hereford Chess Club's 50th centeniary coincides with a painting's 200th birthday. Keep your mind active, and enjoy this beautiful game. Enter into the spirit - congratulate your opponent if they win, offer your opponent a drink if they lose. 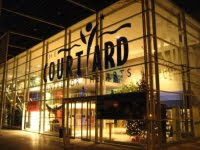 Unwind with a game of pool, darts, quoits or skittles. Come along and play a few casual games or join for only £25/yr which includes entry to club tournaments, English Chess Federation (ECF) membership, and a national ECF grade. Hereford Chess Club's 50th centeniary coincides with a painting's 200th birthday. 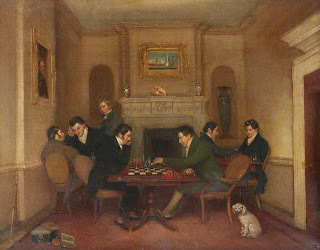 Founded on November 29th 1812, the back of the painting below, called 'Hereford Chess Club' shows possibly the first chess club outside London in the UK. The painting is on display at Hereford Museum. To read more click here A fun chess tournament organized by Alan Leary, was been held in the museum over several days, and won by Roger Aris with 4½/5. 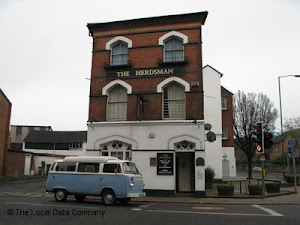 Hopefully a few spectators will want to come to the Herdsman on Monday evening and play a few games of chess. See Hereford Museum's facebook page, and Streatham and Brixton chess club's blog. Clubnight Mon 7-11pm from Oct 1st - end June (click picture to see location). This is a very friendly pub with pool, darts, quoits and a skittle alley. Sat 10-12am social chess followed by live jazz. Wi-fi available. Ring a member to make sure someone will be there.